WKU Department of Geography and Geology staff member and graduate student Jonathan (Joneo) Oglesby returned to Niger, West Africa, this month to continue his thesis research with the Songhai people. 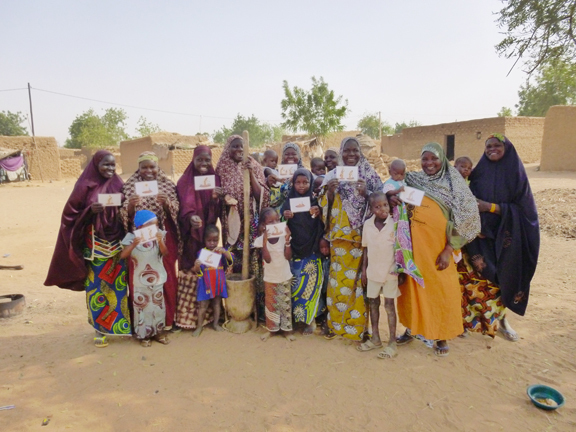 A group of Songhai women and children pose for a picture with WKU’s Jonathan (Joneo) Oglesby after completing a group study in the remote village of Ganguel. Through his research, Oglesby is working with his advisor, Dr. Leslie North, to develop visual communication materials to enhance water literacy concepts for ethnic groups in rural West Africa. Niger is a landlocked state of West Africa located mostly within the Sahara desert. It is one of the poorest regions in the world, with poverty levels reaching 60 percent to 70 percent. Nearly half of the country’s population lives in extreme poverty on less than $1.25 US per day. Health needs exist here that can be traced back to the roots of inadequate water quality, improper sanitation and hygiene behaviors and have led to a burden of disease that self perpetuates. The lack of proper sanitation, hygiene and water in Niger fosters environments where water-borne pathogens and communicable diseases cause high mortality rates. 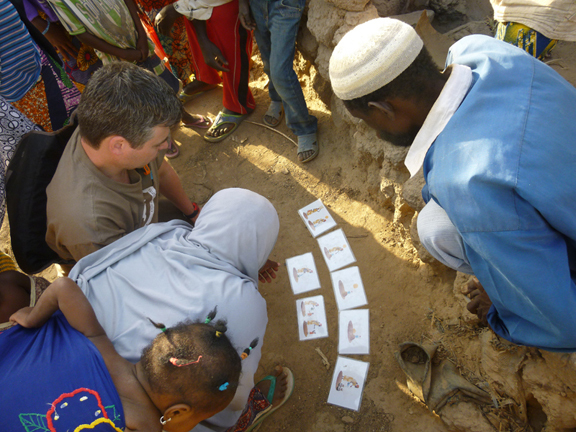 The March 2014 trip was Oglesby’s fourth to the region and focused on the testing of pictograms in low language and low water literacy areas of rural Niger. A pictogram is a unique type of visual communication that incorporates simplistic diagrams and imagery in an effort to improve understanding and recall of concepts. These pictograms developed for this research focus on point and non-point source pollution, sanitation and hygiene protocols, and point-of-use treatment techniques. 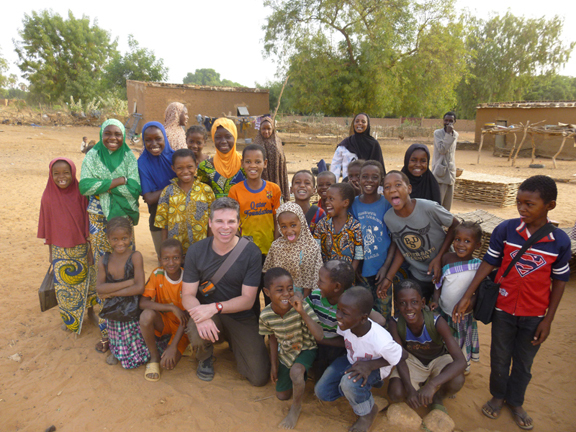 Oglesby traveled to 14 villages along the Niger River conducting 46 interviews, including 673 focus group participants. The villages were a mix of varying populations ranging from 200 to 15,000 residents. In addition, the villages included markets, farming and fishing communities. Jonathan Oglesby tests solar disinfection pictograms with the Songhai. Oglesby will return this summer to continue his work and perform on-site, eye-tracking trials in rural West African villages within the target population. An emphasis for the trials will be on the women who are the primary water fetchers in the community. Eye-tracking refers to the quantitative measurement of an individual’s points of interest and eye movements when viewing visualizations. Using specialized devices, a scientist can identify where an observer is looking when presented with an image, fixation times, and the order of observation. Recently, visualization developers have begun to use eye-tracking data to create graphics that hold the observer’s attention and, consequently, enhance learning about a particular concept. The use of eye-tracking technology for this project will allow for the collection of quantitative data about how the Songhai people view and interact with the developed pictograms. Women and children show off pictograms in the village of Garbey Kourou. For more information about his research, Oglesby has created an organization called Fofo Hari. Results from this research will be made available online via the website www.fofohari.org. Any data acquired, along with outcome assessments, will be shared with the global audience to create conversations that stimulate future endeavors and research in the engagement of underrepresented people groups in relation to water literacy and education. For information about the project or the use of the employed eye-tracking techniques, contact Jonathan Oglesby at jonathan.oglesby@wku.edu or Dr. Leslie North at leslie.north@wku.edu. Contact: Leslie North, (270) 745-5982.